PatternLab for Proteomics - pattern recognition software can be freely downloaded and installed with a single click on the Download button. RAW files can be download here. The database used can be download here. The SEPro file can be download here. The peptide report file can be download here. 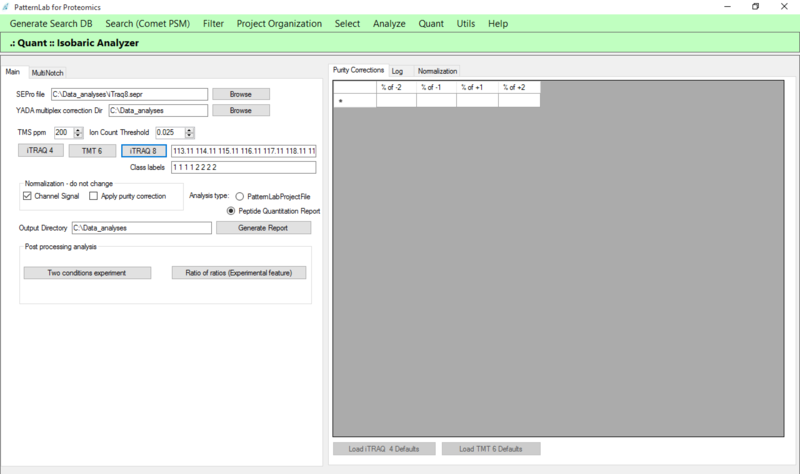 After installing PatternLab for Proteomics, the user is able for analysing proteomics data. Follow step-by-step below to perform the first analysis. In Example dataset, download RAW and database files. The last one contains the protein sequences and the target-reverse decoy sequences. 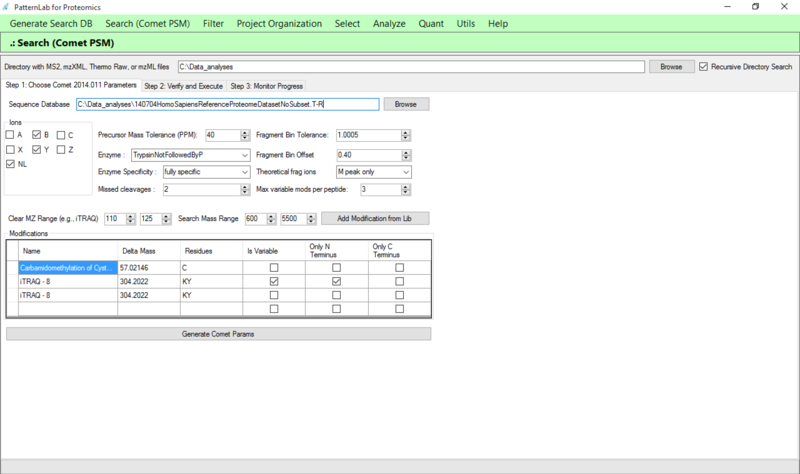 Load the PatternLab for proteomics 4.0; by clicking on Search (Comet PSM) menu, the search engine will be showed. So, set comet params according to Figure 1. The next step is to perform the filtering. 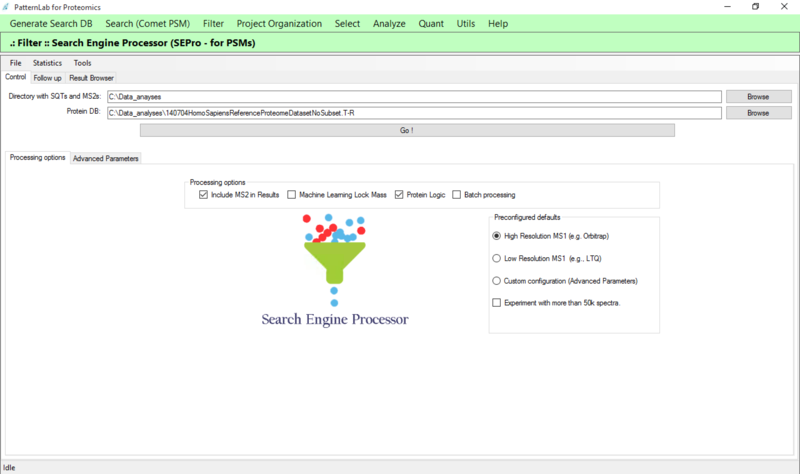 For this, by click on Filter menu, and then Search Engine Processor (SEPro - for PSMs). Set params according to Figure 2. Save the results (*.sepr) by clicking on File menu, and then Save SEPro results, or pressing ALT + S. They are similiar to SEPro result file contained in Example dataset. Go to Quant menu and click on Isobaric Analyzer. 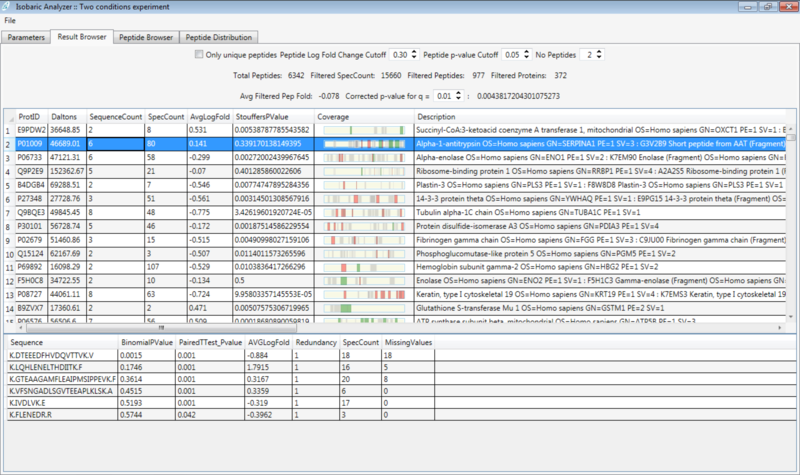 Set params according to Figure 4 and generate the peptide report file. The file generated in the previous step is similar to peptide report file contained in Example dataset. By clicking on Two conditions experiment button, a new window will be opened. 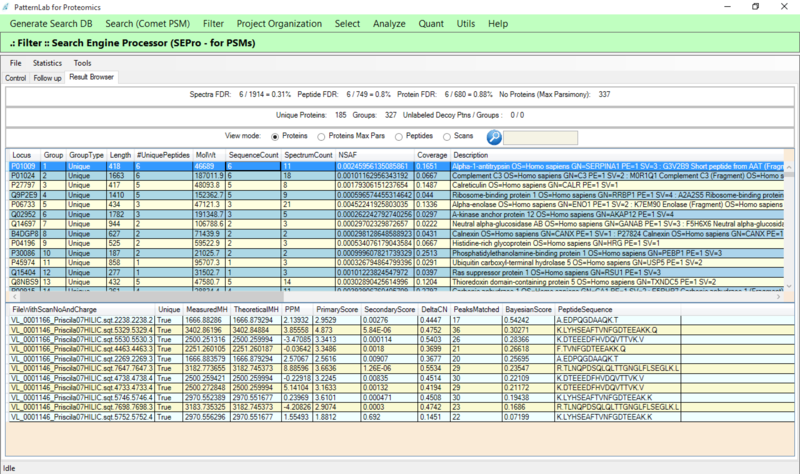 Load the peptide report file generated in previous step and click on Go button for obtaining the analyses (Figure 5). Note: The images below summarize how PatternLab for proteomics 4.0 works. Figure 1 shows the Comet search engine's window. Comet will perform a search using the Peptide Spectrum Matching approach. Set all parameters according to this figure changing the directory with RAW files and the sequence database directory reflecting where your files are. Figure 2 shows the SEPro's window. It is responsible for filtering all data generated by Comet. After filtering the data, SEPro provides a dynamic report containing all identified proteins (Figure 3). The user can visualize the protein coverage, as well as, the spectrum of all identified peptides. Figure 4 shows the Isobaric Analyzer's window. This module will analyse isotopically labeled data, like TMT® or iTRAQ®. Set all parameters as you can see and click on Generate Report button. For analysing two conditions experiment by click on Two conditions experiment button and then, by click on Go button. The results will be displayed on Result Browser tab, as you can see in (Figure 5). 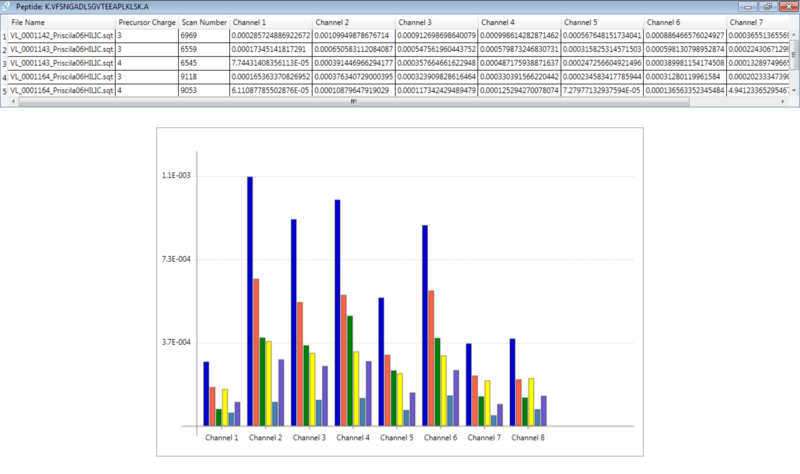 You can visualize a graph showing the intensity signal of each channel from the specific peptide (Figure 6).